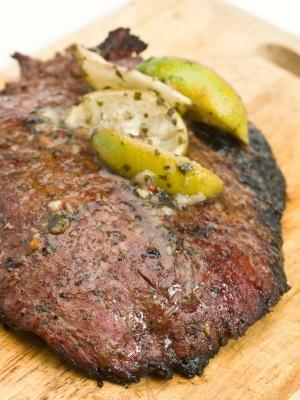 Spring is just around the corner, which means that it is time to dust off the grill and start whipping up a grilled steak marinade to bring that authentic outdoor feel to your next dinner party. Marinades are a wonderful way to make meat more tender and imbue it with a ton of flavor, and there are endless varieties of different to work with. They are so versatile that you can put together several different flavor profiles by using herbs and spices you already have in your cabinet. One of the key reasons to marinate meat is to tenderize it with acidic liquids such as vinegar, wine, lemon or lime juice. The acid breaks down some of the protein bonds. However, too much acid can tighten the bonds instead of breaking them down, so be careful how much you use in your marinade. In addition to acid, other enzymes can also help break down the tough protein bonds in meats. Ginger, papaya, pineapple and kiwi can all play a part in marinades. However, as with acid, too much of these enzymes will make your meat mushy and unappealing. Some dairy products, such as buttermilk and Greek yogurt will also help tenderize meat due to their lactic acid content. Starting with any of these as a base, you can then build any kind of grilled steak marinade. Here are a few key tips to help you create the best grilled steak marinade. Keep in mind that these are just guidelines to help you get started. First, and most important, select the right cuts of meat for the grill. Tough cuts, such as flank steak, skirt steak, sirloin, flat iron, hanger and round steaks are best for marinating because they benefit from tenderizing and have a lot of flavor. Do not marinate prime cuts, such as a tenderloin or New York strip, or you will ruin the meat. Because the cuts for marinating are more tough, it is best to cut them into thin slices. This method gives the meat a lot of surface area for the marinade to penetrate. Slicing the steak into thin pieces is also a way to cut through the connective tissue and tenderize each piece. The thinner pieces will cook more quickly, which makes it less likely to dry out. However, you can also marinate a larger piece of meat overnight and then grill it and slice it into thin pieces after grilling. Once you have finished your marinade, put the mixture and meat or meat slices into a sealable plastic container or bag and work it in by hand so it completely covers each piece of meat. If you are marinating thin slices, let it sit for no more than 2 hours or you will risk making the meat more tough. For a larger piece of meat let it sit for 24 hours so the marinade has time to penetrate throughout. Here are a few excellent marinades to get you started. This sauce hails from Argentina. It imparts a wonderful, herbaceous quality to the meat. Combine all of the ingredients in a bowl and mix well. Add the meat and allow it to sit for two hours (if the pieces are thin) or overnight for a larger cut. Prepare your grill and grill until done. This marinade is excellent for use in fajitas or tacos. Place the steak in a sealable plastic bag and pour in the marinade ingredients. Make sure the meat is completely covered and let it marinate in the refrigerator for between 6 and 16 hours. Use this marinade and pair the meat with vegetables that are sautéed in ginger and garlic for an easy Asian dish. Place your steak in a bowl. Mix all of the marinade ingredients together and then pour the mixture over the steak and let it sit in the refrigerator for 2 to 4 hours. Prior to grilling the steak pour off the marinade into a sauce pot and boil it for 5 minutes and serve as a sauce on the side. When you are finished marinating your meat and are ready to grill it, make certain the meat is as dry as possible before putting it on the grill. You don't want too much oil on the meat or it will cause unwanted flare ups on the grill!